The Green Ice Cure System is a two-part patent-protected concrete curing solution designed to cure concrete faster, increase abrasion resistance and add a high gloss finish that looks like ice! The GreenIce Cure System™, by GreenUmbrella™, is a complete concrete curing solution to help you – the contractor, to cut your labor, cut your downtime and cut your environmental impact. The process begins with our two-part curing products IceStart™ and IceStop™. 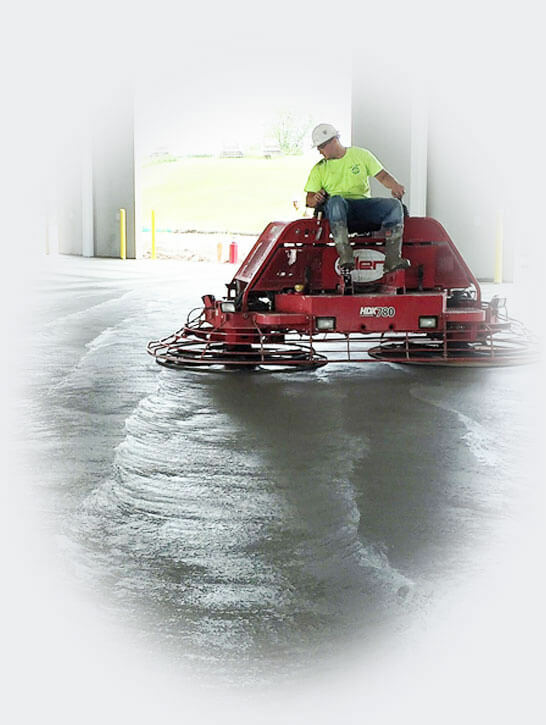 These unique curing agents are specially designed to work with the concrete trowel to reduce or eliminate common problems flatwork finishers face. With our third product, IceCap™, you can achieve the same brilliance as you would with a ground, honed and polished floor specified for many box stores and warehouses – All with less labor, less downtime and less environmental impact. Best of all, unlike traditional concrete curing methods, the entire curing process can be completed in just one day! Proper curing is a vital step when dealing with a concrete floor. Shortcutting the curing process will have a major impact on the quality of your finished work. An improperly or uncured slab is likely to develop cracks, imperfections and ultimately a substrate with low surface integrity that will be more prone to surface abrasion. 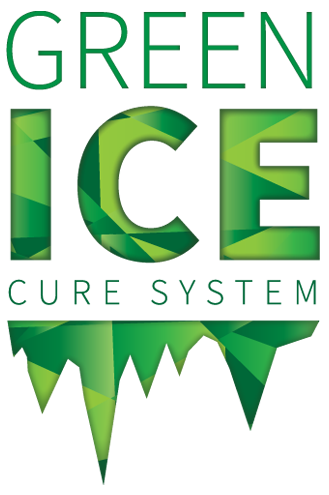 IceStart™ is the first part of the two-part GreenIce Curing System™. 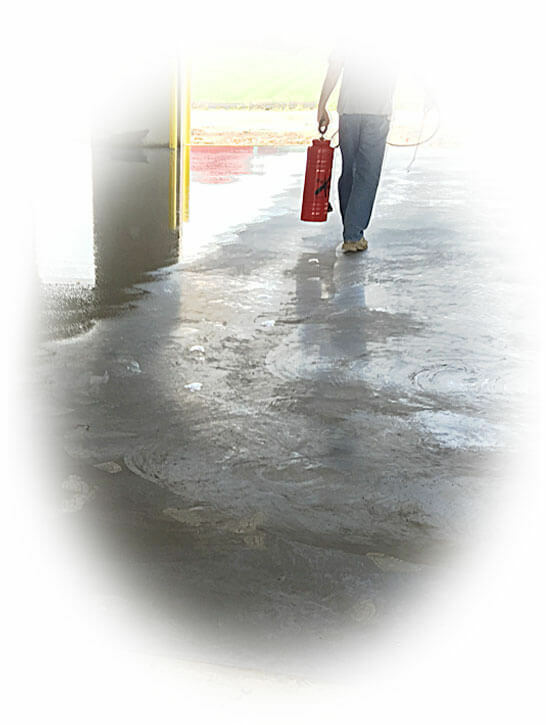 IceStart™ is a unique curing agent designed to retain the water in the concrete, ensuring a properly cured and protected floor. IceStart™ is applied over the concrete during the troweling process. Troweling with IceStart™ is the beginning of a strong floor. IceStart™ is designed to ease finishing by reducing drag on concrete, reducing subsurface lateral micro-cracks, mud cracks, cat faces and shrinkage cracks. IceStart™ provides for a set time that is retarded in hot weather, without extending the set time in cold weather. It eliminates false set and gives control joints a sharper cut. Looks like a mechanically polished (GHP) floor. Better protection than found on mechanically finished floors. Opens new markets for flat-work contractors. A hard troweled surface can be achieved without over-troweling. Increased light reflectance – Averages 45 on a 4,500 psi mix. Chasing a slab that has set up too fast is a thing of the past. Will not result in poor water cement ratio as a result of bleeding slab. Passed ASTM C156 and E96 parameters for curing. IceStop™ is the second part of the GreenIce Curing System™. IceStop™ is applied after IceStart™ to create a protected and properly cured concrete slab. With specially designed hydrophobic properties, this product acts as a fixative while repelling water and adds abrasion resistance while repelling water. After the floor is properly cured, IceStop™ also increases the strength and longevity of the slab. The gloss reading averages in the 40’s. Stop here or top it off with IceCap™ to add a beautiful high-gloss finish, and achieve peak protection. Working as a fixative, IceStop™ is sprayed over the surface once the trowels are finished. Additionally, it creates a protected slab while curing as well as during construction. IceStop™ is applied using garden sprayers or high-volume, low-pressure sprayers. Stops the IceStart™, working as a fixative. Repels liquids – including water, oil and many chemicals during construction. Increases hardness and density, while reducing porosity. Requires no rinsing and disposal and will not gel on surface – can be allowed to air-dry. Decreases black tire marking from lift trucks and other equipment. Stands up to heavy abrasion and foot traffic while providing excellent slip-resistance. After the floor has been treated with IceStart™ and IceStop™, IceCap™ may then applied to achieve the same brilliance as a traditional ground, honed and polished floor. In addition to the unparalleled high-gloss finish, IceCap™ adds additional UV protection and abrasion resistance to the floor. IceCap™ is a non-dissipating, non-resinous chemistry that will produce gloss meter readings between 50 and 70 a 30% increase in reflectivity. To apply IceCap™, simply spray and disperse with a T-bar. After applying IceCap™, burnish with a Green Umbrella-recommended high-speed burnisher to produce gloss readings unreachable by other processes. • 100% reactive with deep penetration. • Produces outstanding floor protection and gloss. • Produces gloss meter readings between 50 and 70 for a 30% increase in reflectivity. • Will not whiten, peel, or flake. • Designed for all surface environments and architectural finishes. Fiberlite™ is a uniquely designed concrete fiber that can be used as a powerful reinforcement. Unlike traditional polypropylene fibers, Fiberlite™ fibers are fully-transparent in the mix and can be dyed and polished. Fiberlite™ enhances durability and eliminates plastic shrinkage due to cracking up to 100%. Green Umbrella Fiberlite™ is a uniquely designed concrete fiber that can be used as a powerful reinforcement. Fiberlite™ can be used as an alternative or combined with wire mesh to reduce cracking due to stress on the slab. When used in a polished concrete application, the fibers are transparent in the mix and can be dyed and polished. Helps retain water inside the concrete as it cures, eliminating false sets, microcracking and flakeoffs. No waiting 28 days for traditional water/chemical curing. GreenIce cures the same day it’s placed. Surface can be sealed in as little as 5 days. Produces a gloss reading that averages in the 40’s. Application of IceCap increases gloss to a range of 50-70. Extends cure time in hot weather, allowing you to work with smaller crews. Does not extend set times in cold weather. Allows finishing of dry shake as if it is normal concrete, yet reduces drag on the concrete. Meets slip resistance standard. Provides a tough seal to prevent the release of vapor, radon and other gasses from the concrete’s capillaries. The product itself is minimally invasive to the environment. Traditional curing methods require 28 days for the concrete slab to properly cure. This long wait time often delays construction projects and ties up work crews. Water must also be applied to prevent evaporation. Water evaporation during the curing process creates problems such cracking, flaking and curling on joints and edges. This is especially problematic in hot weather, requiring larger crews to work quickly. The GreenIce Cure System cures the same day it’s placed – saving time and labor while stopping moisture deterioration issues. This results in a sustainable concrete finish superior to traditional methods. The GreenIce Cure System helps retain water in the concrete as it cures, resulting in the best looking finish. The work time is extended – even in hot weather, which allows for smaller crews and reduced labor costs. Unparalleled Cure, Gloss & Protection At Time of Placement!